The Simpsons has been on forever. The conventional wisdom (and, sure, the reality) is that the show has been bad—or at least unimpressive—for longer than it was, without exaggeration, one of the single most influential and flat-out best TV comedies of all time. I’m not being glib—an average, post-season-10 (or so) roster of episodes is a disappointing mixed bag, with just enough little gems and pleasant surprises to kindle hope for its future, or at least wistfulness for its past. The thing is that, in the years I’ve been reviewing current-day Simpsons, I still go into each episode with not-unjustified hope. All the original main voice cast is here, and, as cranky as Harry Shearer remains about the 29-year gig, they’re all outstanding. And there are good writers on staff, both new and old, capable of pulling off one of those few pleasant surprises per season. I quite liked the script from Tim Long (a Simpsons vet) and Miranda Thompson (a first-timer) for this season’s “Springfield Splendor,” for example, which found a visually inventive, emotionally rich new aspect to the relationship between Marge and Lisa. It’s a challenge to return to the same characters and their world for 2o-plus episodes over 29 seasons and counting, but that world’s uniquely elastic nature is a resettable template that writers can use to explore essentially everything, from the largest societal and pop cultural phenomena to the interactions of the American nuclear family. Sure, sometimes messing with that template makes for a deeper understanding or new perspective on Springfield and its cast of characters. But much of the time, especially in The Simpsons’ post-season-10 history, stretching the world means violating its essential nature. Deforming it. Breaking it, at least temporarily. When it comes to the worst offenders in that category, I’ve always disliked the future episodes most. Apart from “Lisa’s Wedding,” which found the emotional core of Lisa’s relationship with Homer (and which turned out to be an alternate reality/fantasy), such future glimpses are limiting in a way that renders the whole premise of the show moot. The Simpsons is about the struggle, and that struggle is universal. The future for the Simpsons and the rest of Springfield’s denizens is always the thing that’s out of reach. The future is limitless potential, which makes the weekly shenanigans, failures, and inevitable reconciliations so essentially human. 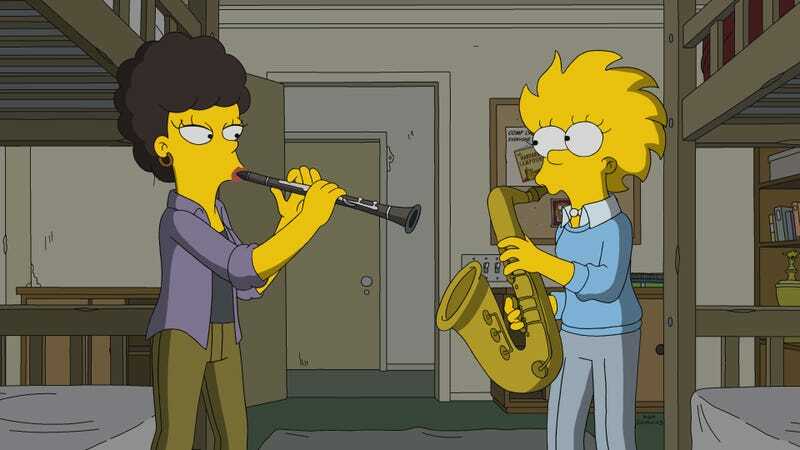 So here, in a temporal mess of an episode from legendary Simpsons writer and producer Al Jean, the reminiscences that form 18-year-old Lisa’s Harvard admissions essay make for dispiriting viewing. It’s not that “Mr. Lisa’s Opus” is especially sour or offensive, in the way that several other such experiments have been. Honestly. it’s so inconsequential that its difficult to work up much of a reaction at all, other than the fact that the story again puts limits on Lisa’s future, and that of everyone else who appears. (Ralph’s still in second grade as Lisa heads off to college, which is supposed to be cute, but which just bums me out.) Jean’s script keeps hopping around, from Lisa as an already precocious one-year-old (a delighted Homer chuckles at her made up words when baby Lisa outstips his vocabulary), to Lisa at 14 (terrified when she discovers that Marge is preparing to leave Homer), to Harvard Lisa, to 7-year-old Lisa, shattered that everyone has forgotten her birthday. There’s hardly any connective tissue among the different versions of Lisa we see. Lisa’s Lisa, of course. Unappreciated, lonely, nerdy, kind, her enthusiasm for life beyond what seems to be her destiny warring with both pessimism about attaining it and guilt about feeling more than a little superior to her family. But there are precious few memorable jokes at any point in the remembered and apparently written-in-stone future we see, Jean settling for callbacks more often than not. 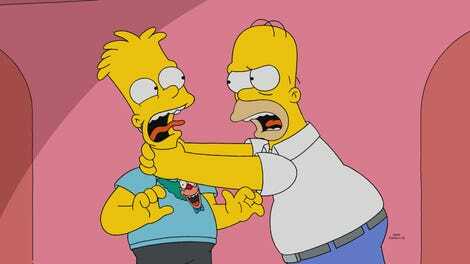 Bart recruits the not-Michael Jackson mental patient to reprise their “Happy Birthday Lisa” song. Artie Ziff shows up as dissatisfied Marge’s tempter. Only a year in the past, Homer and Grandpa are disproportionately less decrepit and bald, respectively, and, 10 years in the future, Santa’s Little Helper is, well, old. We see 7-year-old Lisa hungrily devouring bacon, and 20-year-old slacker Bart reveals he’s already got two kids, somewhere. The 10-years-hence world sees people having developed both telekinesis and the ability to communicate in cat language, the sort of sigh-inducing gags that suggest there are some old Futurama scripts sitting around. (Moe also scuttles around the bar on cybernetic spider legs.) None of it’s funny enough to justify the central conceit of the episode, which is already problematic on its own. Here, though, Jean’s script sends us chasing these different-aged Lisas through the years to no real purpose or effect. There are a few sweet moments that stand out more for their abrupt humanity in the face of the gimmickry as much as their emotional impact. Bart telling Lisa “If there’s one thing I know, it’s that you belong here,” when Lisa’s Harvard confidence is shaken. Toddler Maggie holding up a sign as the Simpsons drive away from Harvard telling her big sister, “You speak for me.” Homer, with more or less a full head of hair, telling baby Lisa, “One year old, and already the most important thing I ever did.” And Lisa’s instant rapport with her outcast new college roommate (guest voice Kat Dennings), where they bond as much over their self-conscious geekiness as their smarts or shared love of jazz. (“Let’s talk normal now.”) That all these memorable moments stem from what we already know and love about these characters rather than any of the showily sloppy machinations of this episode is a lesson The Simpsons could use as a guide going forward. Not that this episode needed to spend any longer in its timeline concept, but ending the episode with a long, 1990s-updated version of the All In The Family opening and closing credits is awfully superfluous. Nice to see Norman Lear pop up, though. To resolve the divorce crisis, Homer quits drinking, with Ned’s help. It takes about five minutes. Still, Homer gets in a few decent lines during Ned’s 12-steppin’. Responding to Flanders telling him to confess that there’s power greater than himself, Homer posits, “If I’m powerless, isn’t every power greater than myself?” And his prayer “Dear Lord, the Satan in heaven, I order you to fix me,” isn’t exactly what Ned had in mind. I like that Harvard’s drone delivering Lisa’s acceptance letter shoots down the drones from competing colleges with laser beams. Following up on one of the family photographs in a past future episode, Lisa and her female roommate are seen tentatively flirting. For a series so informed by Harvard types, all the Harvard jokes in the episode are strangely generic. There were more lived-in Ohio State jokes this season, for crying out loud. In 14-year-old Lisa’s Harvard fantasy, she responds to her dream boyfriend’s suggestion that they date other people by agreeing sweetly—and then imagining that the buildings suddenly bury him in rubble. Atta girl. More Simpsons... or are they?! The Simpsons: "Days Of Future Future"